More than any other Persian poet—even Rumi—Hafiz expanded the mystical, healing dimensions of poetry. Because his poems were often ecstatic love songs from God to his beloved world, many have called Hafiz the “Invisible Tongue.” Indeed, Daniel Ladinsky has said that his work with Hafiz is an attempt to do the impossible: to render Light into words—to make the Luminous Resonance of God tangible to our finite senses. With this stunning collection of Hafiz’s most intimate poems, Ladinsky has succeeded brilliantly in presenting the essence of one of Islam’s greatest poetic and religious voices. Each line of The Gift imparts the wonderful qualities of this master Sufi poet and spiritual teacher: encouragement, an audacious love that touches lives, profound knowledge, generosity, and a sweet, playful genius unparalleled in world literature. 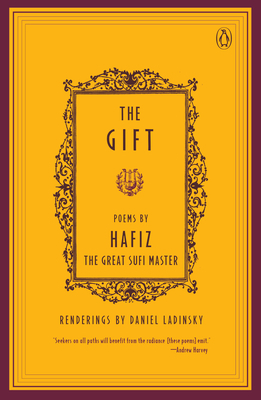 Daniel Ladinsky has published three previous translations of Hafiz's poems, The Gift, The Subject Tonight Is Love, and I Heard God Laughing, as well as a collection of translations of poems by twelve mystics and saints, Love Poems From God. His most recent collection is The Purity of Desire: 100 Poems of Rumi. For six years, he made his home in a spiritual community in western India, where he worked and lived with the intimate disciples and family of Avatar Meher Baba. He lives in Myrtle Beach, South Carolina.